--Note the edges in this image.. not straight and neat are they? Actually, you are more likely to have even edged if you fabric started out from the same manufacturer. >>In this image, the seam has already been trimmed, but see how the zipper is tacked together at the top? The fold the tube so zipper is on one side, and mark the other size (a small notch cut at edge )--This is to find the exact opposite point from the zipper. Refold, and position zipper center at center of notch. This will center the zipper. Sew the top seam first. After doing that un zip the the zipper at least half way, then sew the bottom edge. It's easier to sew the tube with the zipper closed.. so you close 100%, sew the top of bag (top of zipper) and then partial un zip, and sew the bottom of the bag (with the zipper still zipped at the bottom of the bag). Next, the just sewn seams need to be trimmed, in order to make the corners, (which will change the flat tube to a 4 sided, 3 dimentional bag. Take the ruler, and measuring from a fixed point. For for me, the fixed point is the outside (folded edges)side edges of the tube, but you could also measure from the center of zipper. 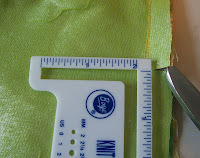 Find the half way point between the center front (zipper) and the outside edge of the bag. (If you started with 22 inches of fabric, and 'used' a ½ inch or so for the zipper casing, and folded the fabric in half your tube will be ½ of 22 inches, (oe 11 inches) minus another ½ inch or about 10.5 inches.. so the half way point between the zipper and side (fold) will be about 2 ¼ inches. If your 'fat quarter' was a little bigger (22½ inches)or a little smaller, your measurement might be a little different. You don't have to be exact, but do be consistent! If you chose 2¼ inches as your point, chose it on all 4 corners! 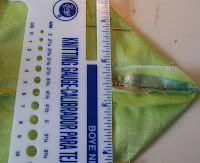 Make a notch (cut up to, but not into seam) and trim seam allowance close to seam, (about 1/8th inch) in center--but leave the seam allowance in place at the corners. The last Trim(2) the folded edge of the corners-Then trim off the excess fabric from the corners. (see how the corners are now / and \ on each edge? Now fold the corners of the tube.. (all 4) like this.. 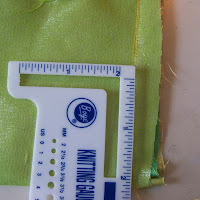 If you want, you can use the ruler as a straight edge, and mark a seam line (a plain old #2 pencil will work, or make a dotted line with a fine tipped marker, or use 'tailors chalk'--or you can just eye ball the seam/sewing line, using the pins as a guide. Repeat at all 4 corners! All that is left is finishing the seams. I like to zig zag over the corner seam, and enclose the top and bottom seam in bias tape.This is optional, but a nice finish. 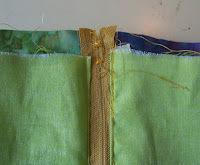 Bias tape can be just sewn in place--just fold it over the seam, and use a zig zag stitch to hold it in place. Then top stitch (close to seam line) the bottom edge of bag, making sure as you do to sew through the bias tape enclosed seam--if you haven't bothered to enclose the seam, just finger press the seam to the bottom of the bag, and top stitch through all the layers (this is a bit of pain to do, but it gives the bag a nice finish. Trim all and any loose threads, and you bag is done!